→How Long Can A Baby Sleep in Rock and Play? Rock and Play Sleeper: How useful is it? Rock and Play sleepers literally are like inclined baby beds that rock babies to sleep. I like the type that has a motor that rocks the sleeper automatically. However, there are basic models that you need to rock manually. The bright side is, they feature vibration option that auto version does not have. Here is the Rock and Play Sleeper I got for my little one. Do you see those colorful hanging toys? My baby plays with it until she dozes off to sleep. Rock and play sleeper is useful for my baby and me. This portable sleeper keeps my baby safe while I am busy doing the house chores. It is perfect for babies with reflux too. How long Can Baby Sleep in Rock and Play? There is really no specific age on how long a baby can sleep in rock and play. Some babies make use of it for a short while, but other moms are having a hard time cutting off the “rock and play” habit from their growing babies. The maximum weight limit for Rock and Play sleepers is 25 lbs. Therefore, babies can still make use of this sleeper as long as they will not exceed the weight limit. Baby boys reach 25 lbs. at an average of 21 months, while baby girls reach it at around 23 months. Hence, that is how long a baby can sleep safely on rock and play. Let’s accept it. The Rock and Play sleeper have been your best friend. It became your baby’s cozy nook for the past months. Wherever you go, it’s ready to soothe your baby with its vibration, music and auto rocker. However, it’s time to wean your little one. One sign that your baby needs to give up the rock and play is when they start to learn how to roll. Of course, you need to transfer her to the crib right away. An immediate transition will feel like a disaster, and you’ll be miserable. Nevertheless, these tips may help you lessen the difficulty. I let my baby use the crib gradually just to make her familiar with the new place. During her naps, I place her inside the crib instead of the rock and play. At first, I transfer her to the crib after dozing off on the sleeper. 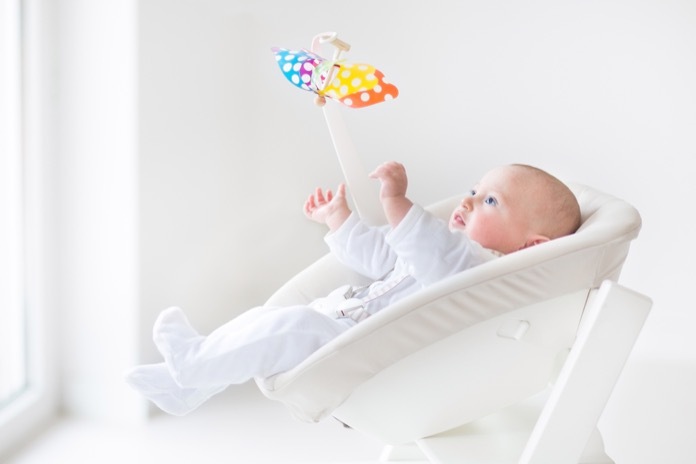 The Rock and play are comforting to the baby because of the soft and secure feeling of cuddling. 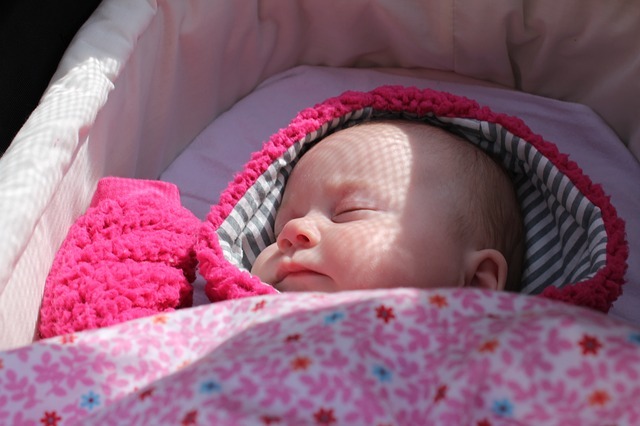 Once your baby starts sleeping on her crib, you may want to use a swaddle or sleep sack in the transition. At least, the cradling comfort will still be there while she’s getting used to her new space. Sound machines are helpful to calm down babies. Turn on your baby’s sound machine to keep her relax while sleeping. I like to use the sound of nature for my baby. She easily dozes off with the trickling sound of waters. Make a routine. Babies are great in adapting to time. Insert the sleeping in the crib schedule within the series of activities within the day. Do it daily, the same time and sequence. Baby monitors come in handy for worried moms. For the last few months, your baby is within your reach every night. Baby monitors help you with the transition by letting you know she is okay while sleeping on the crib. Be firm. The transition would be difficult for both your baby and you. However, be consistent. There is no turning back. It’s time to get rid of the rock and play sleeper. Your baby will catch up, and so will you. There were speculations that Rock and Play sleeper can cause SID, flatheads, and other deformities. Do you believe in this controversy? Complete awareness of these concerns will prevent this from happening. Here is what I can say. Rock and Play sleeper make babies sleep in comfort. However, NEVER let your baby sleep overnight without your supervision or out of your reach. Pads may shift, will get in the way, and may cause suffocation. Rock and Play sleepers are the first bed for your newborn. She spends hours sleeping within the whole day on it. Your baby can’t move freely and may rest with the same position the entire night. Eventually, this can cause flat head syndrome and other deformities. It would be helpful in changing the direction of your baby’s head frequently during sleeping. The Rock and Play are perfect for your sleepy head only when used with supervision. It’s also important that the instructions are followed correctly for your baby’s safety. Hence, you’ll be able to enjoy the benefits that it offers. Of course, you must also take note of how long a baby can sleep in rock and play sleepers. Even though it’s been effective in soothing your baby to sleep, the time to transfer her to a crib will always come. I didn’t say it would be easy, but you will get over it, I promise. Do you have a rock and play? You could comment here if you got some questions! This Is The Only Answer To "How Many Crib Sheets Do I Need?" What To Put In A Baby Crib And What Doesn't Go With The Crib?